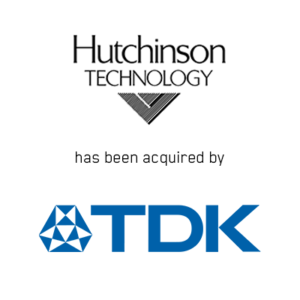 Tokyo, Japan and Hutchinson, MN (November 2, 2015) – TDK Corporation (“TDK”) and Hutchinson Technology Incorporated (NASDAQ: HTCH) (“HTI”) today jointly announced that they have entered into a definitive merger agreement under which TDK will acquire all of the outstanding shares of common stock of HTI forbase consideration of US$3.62 per share, plus additional consideration of up to US$0.38 per share, depending on the level of cash (subject to certain adjustments) less any outstanding borrowings on HTI’s revolving line of credit (“net cash”) held by HTI as of the last day of the fiscal month immediately preceding the closing date. The amount of additional consideration, if any, will equal approximately US$0.01 per share for each US$500,000 of HTI’s net cash over US$17.5 million as of the measurement date. As of September 27, 2015, HTI’s net cash position was approximately US$40 million. In addition to the satisfaction of HTI’s outstanding debt, the merger values HTI’s equity at approximately $126 million to $140 million on a fully diluted basis. The transaction, which has been unanimously approved by each company’s board of directors, is currently expected to close in the first calendar quarter of 2016, subject to HTI shareholders’ approval, regulatory approvals and other customary closing conditions. HTI’s board of directors recommends that shareholders vote to approve the transaction. For this transaction, Janes Capital Partners is acting as financial advisor to TDK and Nixon Peabody LLP is acting as TDK’s legal counsel. BofA Merrill Lynch is acting as financial advisor to HTI and Faegre Baker Daniels LLP is acting as HTI’s legal counsel. TDK Corporation is a leading electronics company based in Tokyo, Japan. It was established in 1935 to commercialize ferrite, a key material in electronic and magnetic products. TDK’s portfolio includes electronic components, modules and systems marketed under the product brands TDK and EPCOS, power supplies, magnetic application products as well as energy devices, flash memory application devices, and others. TDK focuses on demanding markets in the areas of information and communication technology and consumer, automotive and industrial electronics. The company has a network of design and manufacturing locations and sales offices in Asia, Europe, and in North and South America. In fiscal 2015, TDK posted total sales of US$9.0 billion and employed about 88,000 people worldwide. Hutchinson Technology is a global supplier of critical precision component technologies. As a key supplier of suspension assemblies for disk drives, HTI helps customers improve overall disk drive performance and meet the demands of an ever-expanding digital universe. Through its new business development initiatives, HTI focuses on leveraging its unique precision manufacturing capabilities in new markets to improve product performance, reduce size, lower cost, and reduce time to market.